One last zucchini recipe to finish off the week! I realize a lot of people are switching to fall mode now, with pumpkin and apple recipes and lots of warming comfort foods. These do not fall under that category. But in my defense, it is still hot here and still feels like summer, so I can’t bring myself to shift from summer to fall just yet. There is an apple stand on my way to work that’s just calling my name, but I’m not yet ready for apple pie or other yummy apple goodies. Their time will come soon enough, and there will be a large box of apples waiting for me when I’m ready! To make the cupcakes: Preheat oven to 350 degrees F. Line 24 standard muffin pan cups with paper baking cups. In a large bowl, combine cake mix, eggs, buttermilk, oil, cinnamon, nutmeg, and allspice; beat according to package directions. Fold in the zucchini and pineapple, mixing well to distribute evenly. Divide the batter evenly between the muffin cups. Bake 20 to 22 minutes or until toothpick inserted into centers comes out clean. Cool 10 minutes in pan on wire rack. Transfer to wire rack to cool completely. To make the frosting: While the cupcakes are cooling, combine powdered sugar, sour cream, butter, and lemon zest in a large bowl with electric or stand mixer at low speed. Beat at medium speed until smooth. Frost cooled cupcakes with an offset spatula. Garnish with additional lemon peel, if desired. Serve at room temperature. Store leftover cupcakes in refrigerator. So moist and the frosting goes well the cupcake! Haha, these zucchinis 😀 I still haven’t been brave enough to try one in a dessert dish, although I bet they actually go really well with pineapple – they both share similar textures etc. That frosting looks amazing too, so smooth and creamy, beautiful! Maybe I’m weird, but every zucchini recipe is comfort food for me! I am not a big fan of pumpkins and other similar squashes, but I couldn’t live without zucchini. It looks like you buy zucchini in bulk 😉 Just joking! It’s such a pleasure to see so many recipes with my beloved vegetable. These cupcakes look fantastic and somehow I even can imagine pineapple as a good pairing here. A very creative recipe! I have seen zucchini based desserts..but the combination with pineapples is just so different..wow!! 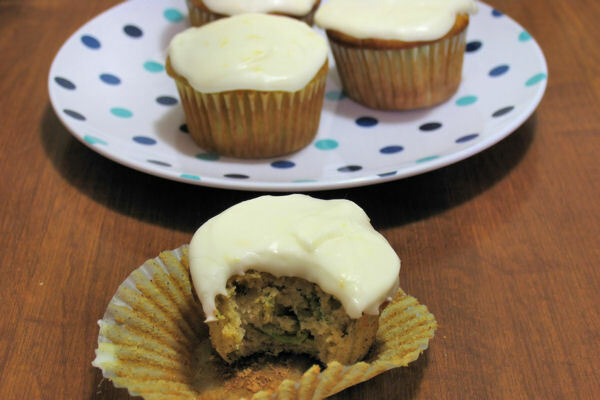 Loving this zucchini recipe! We just finished zucchini month on s&h. I wish I weren’t allergic to pineapple so I could eat this :). It’s cool here, but I’m sure there will be another hot spell. We’re still getting lots of zucchini. (from the farmers market) Anyway, this looks great, love the icing. These are perfect for my quest to eat healthy! These sound delicious. I have a ton of squash recipes as well. ha ha. 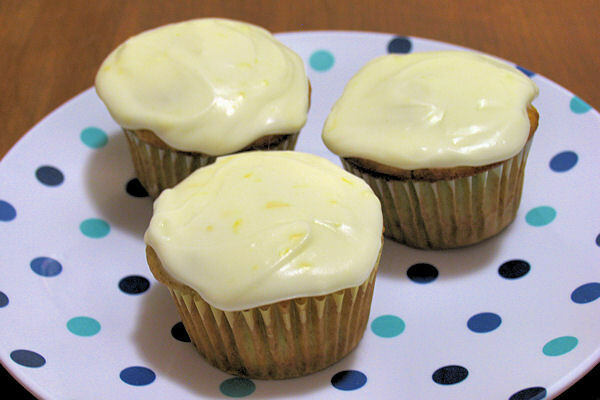 I love the combination here with the pineapple and the lemon sour cream frosting. YUM!